In another time, with more advanced forms of social media than the rather limited regional word-of-mouth campaigns of the 1940’s, Forrest Sykes might’ve been a star, or at least a cult figure of renown. A flamboyant, gin guzzling, piano wizard who years before Jerry Lee Lewis would gain fame by turning the instrument into a platform for musical self-aggrandizement, Forrest Sykes reportedly did just that everywhere he went. 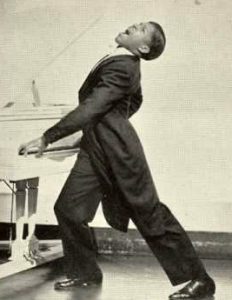 An purportedly gay hell-raiser known as “Madcap”, Sykes built a reputation among other musicians as one of the best boogie pianists of the day, playing briefly with Lionel Hampton before getting his own shot at glory on the still-rather commercially limited Aristocrat label. As impressive as his limited recorded work was, it was in live settings where Sykes stood out, drawing immediate attention by playing standing up and by turning any song into a tour de force performance, wrecking pianos in the process with his relentless attacks. Sykes prodigious drinking soon got the best of him, first by increasingly limiting his professional options, then claiming his life in the early 1950’s while still far too young, leaving behind just a few fading testimonies, along with scant recorded evidence, as to his virtuosity.